Weather-permitting, the South Entrance to Yellowstone National Park will reopen to vehicles 8 a.m. Friday, May 11, 2018. 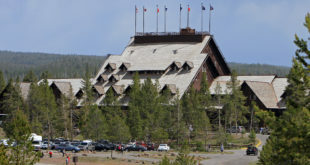 In addition, the road connecting Old Faithful and West Thumb (through the Craig Pass) and the road between Tower Junction and Tower Fall will reopen. Read here for the complete list of opening and closing dates in Yellowstone National Park. We’re just a couple weeks away from Memorial Day weekend, which marks the official start of the summer season in Yellowstone National Park. It also marks the start of fishing season in Yellowstone. Following this set of road openings, the only Yellowstone route left to reopen will be the Dunraven Pass, which connects Canyon Village to Tower Fall. The Beartooth Highway is also slated to reopen, weather-permitting. You can see the full road schedule here, including information about construction delays around the park.